Katherine Pettus is the Advocacy Officer for Human Rights and Palliative Care at IAHPC. She holds a PhD in Political Theory from Columbia University, and a Masters in Health Policy and Law from the University of California San Diego. Her PhD dissertation appeared as a book, ‘Felony Disenfranchisement in America’, now in 2nd edition with SUNY Press, and her Masters Thesis studied the interface between international law and access to essential controlled medicines. She has contributed many chapters to multi-authored volumes and has contributed to journal articles on palliative care and health policy. Katherine trained in California as a hospice volunteer in 2010 and joined the Leadership Development Initiative at the Institute for Palliative Medicine in 2011 in San Diego and Columbus. 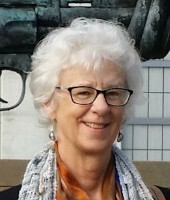 She joined the IAHPC in 2014. As IAHPC Advocacy Officer, Katherine travels to meetings around the world, advocating for improved access to internationally controlled essential medicines such as morphine, as a component of the right to health. She also addresses palliative care issues for older persons, for children, in universal coverage, for non- communicable diseases (NCDs), and palliative care medications in national essential medicines lists. She is currently serving on the Board of the Geneva Global Health Hub, G2H2. She grounds her European and US advocacy work in her visits to partners in Latin America, Africa, and India, where she participates ‘as often as possible’ in home care with colleagues and their teams who work in extremely challenging circumstances to deliver palliative care to the indigent and mentally ill. She identifies her original role models/mentors as Dr. Anne Merriman in Uganda, and Dr. M.R. Rajagopal in Kerala. In her ‘down time’ Katherine enjoys reading, meditation, yoga, and long walks, preferably in the countryside. She particularly loves visiting her sons and young grandchildren in Taos, New Mexico and California.